Capitalizing on a domestic market that currently imports over 90% of its petroleum, Anatolia Energy (TSX-V:AEE) has accumulated 336,509 net acres over eight onshore licenses within the Anatolia Basin in Southeast Turkey in addition to retaining its interest in the 51,450 net acre LLA-24 block in the Llanos Basin, Colombia. Together with the privately-owned Turkish conglomerate Çalik Enerji, Anatolia has identified 15 prospects in Turkey and four in Colombia, and is poised to develop both conventional and unconventional oil targets among five major exploration areas (Four in Turkey and one in Colombia). One of these trends, the oil source rock, the Silurian Dadas shale, holds significant potential as modern techniques designed to unlock tightly held hydrocarbons, such as horizontal drilling and multi-stage fracturing, have yet to be employed in Turkey. While Turkey is establishing itself as a pillar in the region, in terms of growth, continuity and security, the country's future is hinged upon its energy dependence. Led by a popular Prime Minister who was elected for the second time with over 50% of the vote and a solid majority in parliament, the government has a mandate to continue its growth and development. In order to keep up with its rapid GDP growth (11.7% in Q1 of 2011, the fastest growth in Europe), a move to mitigate international energy dependence is essential. What Anatolia is seeking are light oil developments coming from the source rock that's abundant in the region. Turkey is proven to be an "oily" place, where a number of light and heavy oil fields have been discovered with some more developed than others. With a growing economy, government support and a secure region with a lot of room to grow, Anatolia has strategically chosen Turkey as its main stage from which to operate going forward. Though Anatolia currently has four exploration areas across Southeast Turkey, the company's portfolio and working interest are really built on two concepts: Development of Conventional Light Sweet Crude (between 25% and 50% W.I. in six licences), and Unconventional Shale Oil (50% W.I. in three licences). The former is appealing from an expedient route to cash flow standpoint, while the latter is where the majority of the upside appears. The Dadas Shale holds the most upside potential for Anatolia going forward. 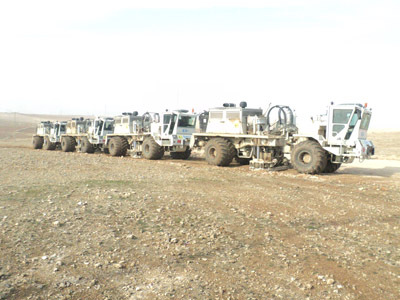 Embedded in the same regional source rock that spreads across the entire Northern African region and which has hosted over 300 different oil fields, the Dadas has exhibited signs of a very rich shale oil reservoir. Anatolia intends to focus where this shale intersects the oil window in a recoverable form. If the hydrocarbons are embedded too deep, they convert into natural gas under the pressure. And despite the fact that natural gas prices in the region are much higher than what is seen in North America, the target is still undoubtedly liquid in nature. Anatolia believes that this source rock will be in both its Bismil and Sinan properties as well as in its 480,000 gross acre Antep licence. The idea is to produce oil directly from this shale in a similar fashion to that being uncovered in North America's Eagleford Play. Like any other shale play, true commercial production will require horizontal drilling with multi-stage fracturing techniques in the well bores. While this can be expensive, proving the concept of these shales in the near term can be one with less expensive vertical wells, specialized analysis of cores, increased seismic data analysis and by using existing well bores to do pilot tests. Fortunately for Anatolia, this first step has already been completed by nearby neighbors. TransAtlantic, successfully flowed hydrocarbons from a pilot test earlier this year on their Goksu well as did Turkish Petroleum (Turkey's National Oil Company) in its Ciksor well. This encouraged Anatolia as these vertical wells and fracs proved that hydrocarbons were movable within the Dadas, as gas and condensate flowed with just a mini-frac within the Goksu and Ciksor vertical wells. One can only imagine what the flow rates would be with a proper horizontal well coupled with multi-stage frac implementation. The emergence of the Dadas Shale as a potential resource play received further attention on November 23rd, 2011 when Shell entered into an agreement with Turkish Petroleum to test the Dadas potential in southeastern Turkey through a 5 well work program. Other major oil companies have expressed an interest in developing the Dadas production in this region. Already with a light, sweet crude discovery on the license, Bismil is Anatolia's most advanced property. Hence Bismil is the first licence to be drilled, with the initial Çaliktepe-1 well drilled in late 2010 and more recently Çaliktepe-2 which was drilled in late 2011/early 2012. 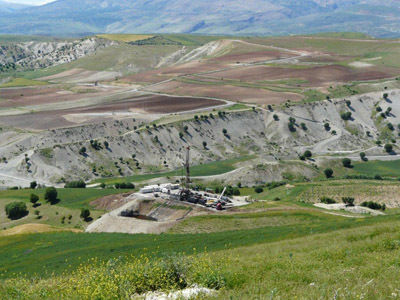 While the Çaliktepe-2 ultimately resulted in a dry hole, it accounted for only 300,000 of Anatolia's 52.3 million barrels of prospective resources. The well did, however, serve two very important functions. First, it provided a critical data point for Anatolia's technical team to better map the remaining prospects on the licence, which the company feels have not been impacted by the dry hole. Management anticipates that another well could be drilled at Bismil in 2012, based on this updated mapping. Secondly, five cores totaling 30 meters were extracted from the Dadas shale and shipped to Calgary where they are being analyzed using state of the art processes specifically designed for shale reservoirs. Results from this analysis are expected in April 2012. The Dadas Shale continues to display excellent oil source properties and potential as an unconventional oil reservoir and the company anticipates testing the shale further by completing a horizontal well and fracture stimulation from the existing Caliktepe-1 and 2 wellbores at an estimated cost of $3million/well. Through recently completed seismic programs on the Besni and Antep licenses, the company is analyzing the data to determine drill targets for these high impact licences targeting light oil. Antep is a sizable licence sitting on the Syria border where major structures from Syria come into Turkey. These structures represent potential that is an order of magnitude greater than the Bismil licence where resource potential can be upwards of 20 million barrels per structure. Despite smaller structures than Antep, Besni offers the potential for high productivity wells that present very robust economics given that they are shallower targets and, hence, cheaper to drill. This is evidenced by the Turkish state oil company's recent discovery in the area that commenced production at 3,000 bopd. But as much as is known about Turkish oil fields, information pertaining to neighbouring basins in Syria and Iraq is shining a light on what Anatolia is also pursuing in 2012. Successful redevelopment of heavy oil projects in Syria has left the AEE team keen to seek redevelopment properties in Turkey. Similarly, the team is eager to extend the Zagros foldbelt play into Turkey. In addition to its suite of Turkish assets, Anatolia still has a remaining asset in Colombia as part of its amalgamation with Bolivar Energy. The LLA-24 block is situated in the Llanos Basin in Colombia and provides the opportunity for multi-zone stacked potential. The block, covering an area of approximately 147,000 gross acres (51,450 net) is surrounded by light oil production and numerous oil field discoveries. Drilling of the first exploration well (Las Palmeras-1) is currently in progress with results expected before the end of March 2012. Upon the completion of drilling of Las Plameras-1, Anatolia will have earned a 35% interest in the block. Assignment of this interest is subject to approval by the Agencia Nacional de Hidrocarburos. From a leadership standpoint, the Anatolia Energy team is a veritable who's who of international experience. Leading the way is CEO Bob Spring, with nearly three decades of oil and gas mileage, most notably punctuated with his role as VP Exploration and Land for ConocoPhillips Canada where he was in charge of an operating budget of $120MM, and a key member of Conoco's International Exploration team. Mr. Spring is accompanied by Tim Marchant, Anatolia's executive chairman, with 30 years petroleum experience in Canadian and international exploration, development, production and business development. Mr. Marchant most recent position was VP Middle East BP International. Spring and Marchant's support comes from a board that brings experience in raising equity, joint ventures, exploration, international geological work and technological expertise. Between the Board and Management, this team literally brings hundreds of years of oil and gas know-how, peppered with roles of high-importance among big players such as Nexen, Suncor, BP/Amoco, Exxon, Enerplus, Petro-Canada and Pacific Rubiales. But more important than the companies listed on the board's resumes, are the countries on the map that this team has operated within. Spring and his team bring experience developing projects within a list that includes Algeria, Libya, Yemen, Albania, Egypt, the United Arab Emirates, Kuwait, Albania among other countries, but most importantly also includes Turkey and Colombia. From an investment standpoint, Anatolia should be easy to follow in 2012, as it inherited $16MM from its recently closed merger and listing. The money is slated to be spent on drilling and completions only, as the structure of the partnership with Çalik directs all of Anatolia's spending into the ground. At the core of the deal is a commitment of $26.5MM to earn 25% on the conventional play in Bismil and 50% on each of the other licences. To date, Anatolia has funded $18MM of that obligation, which has included five seismic programs and the drilling of the Çaliktepe-2 well. In addition to its favourable business procedures, Çalik appealed to Anatolia with its land positions, technical know-how and regional awareness. With a management team consisting of primarily formerly TPAO (state oil company) staff, Calik knows how to drill wells, shoot seismic and appease locals. Prior to its partnership with Anatolia, Çalik has proven that it can work effectively with Canadian companies, through teaming up Anatolia Mining, (now Alacer Gold). which had built up a gold asset in Turkey. With Çalik's support, the gold asset went into production, and built the company into a $3B market cap gold producer. Anatolia Energy has established a significant land position with a successful partner, Çalik Enerji, in the petroleum starved country of Turkey. Through combining low-risk conventional oil plays with the larger upside shale play in the Dadas, Anatolia stands to play a big part in aiding Turkey's move towards reduced energy import requirements. By bringing a heavily experienced management team and modern drilling and development technology to Turkey, along with the help of a local giant in Çalik, Anatolia has plenty of upside in one of Europe's fastest growing economies.